Circus Engelbregt is a unifying disruptive organisation aiming to increase social sustainability in the world. 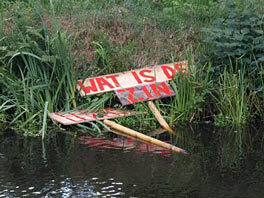 We initiate and develop (art)projects aiming to change people’s perception of the habitual and the seemingly obvious. From the calmness that comes with not knowing, we try to create new movement. We are not afraid to create some friction or to take on a confronting position in our projects, because we don’t believe in a society stuck in stereotypical thinking. 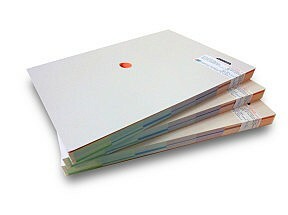 Numerous projects have been added to collections of companies and individuals. These are existing works designed specifically for a particular location. Furthermore, we sell publications and other graphic prints arising from our projects. We established various initiatives, which are all based on their own policy, design and purpose. We view these projects as different acts having their own place in Circus Engelbregt. It’s important to us not to solely respond to external questions but to develop and design our own ideas and introduce them to the world as well. The initiatives on this page are mostly continually active and we are always looking for new collaborations and participants. Based on our background in graphic design we love to work in commission at extraordinary locations, using our insight and expertise. We work for museums, semi- public institutions and more and more often for private companies as well. 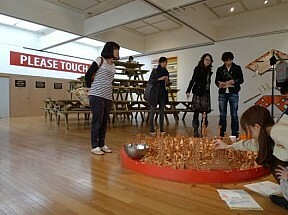 It could concern projects for which an art piece is required, but we also initiate interactive processes in which visitors or those concerned become part of the project itself. The workshops we provide often grow from experience gained in autonomous projects. We offer our existing workshops for bookings and welcome the opportunity to develop new workshops for specific events or occasions as well. 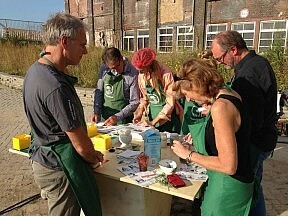 In addition to hosting workshops, we have experience in art education. In 2014 we collaborated with TAAK to set up a Masters programme at Sandberg Institute. During this Cure Master we research the transformative power of injury and illness. Lastly, we lecture regularly about our work, specific projects or the outcome of finalised research. People seem to be more aware of their fear of physical contact than their desires. In this period in which people become aware of unwanted intimacies via #MeToo, Please Touch breaks through taboos and promotes desired intimacies. 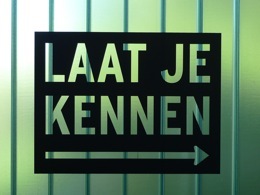 UIT JE HOKJE is a public starting point for encounters about fear of, and desire for, your own and other people’s sexuality. Quack Ointment - an ointment that helps anyone. It's good for what ails you. The ointment is 100% pure, made of helpful plants and active ingredients, with no chemical additives such as yeast, gluten, colourings, flavourings, or preservatives. 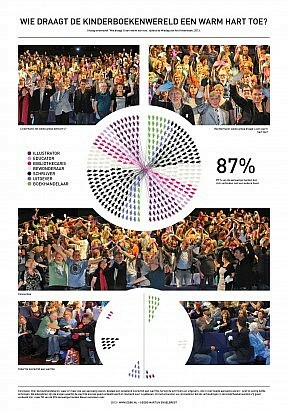 Circus Engelbregt won in September 2018 the Victoriefonds Cultuurprijs in the category Visual Arts. 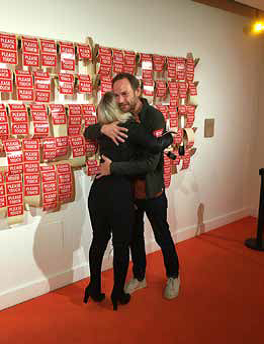 Martijn was nominated with Catinka Kersten and Gerben Hermanus. 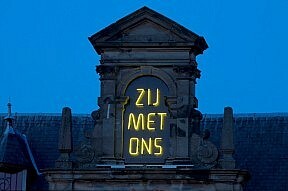 As part of the nomination the three artists showed a selection of their work at Stedelijk Museum Alkmaar. At the Entrance Ritual in the former Bijlmer Bajes visitors of the Temporary Museum were welcomed in a maze of instructions and paper reality. 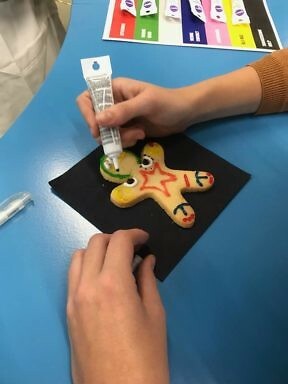 An autonomous outpatient clinic where symbolic human figures made of cookie dough were handed out. 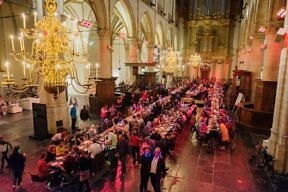 The Grote Sintlaurenskerk Alkmaar became the living room and kitchen for all the members of Alkmaar for one night. TAO Boxclub is een actieve avond waarbij je op ontspannen en speelse wijze wordt meegevoerd in expressieve en verstillende bewegingsvormen uit de wondere wereld van de TAO. As a freelancer you are in charge of the way you work. This offers freedom, but also involves responsibilities: you have to reflect on your own performances. In a challenging walk of about two hours we discover together what your pitfalls are, and how you can get even more success. The workshop Touch My Body lets participants experience if their rules about touching need a recalibration. 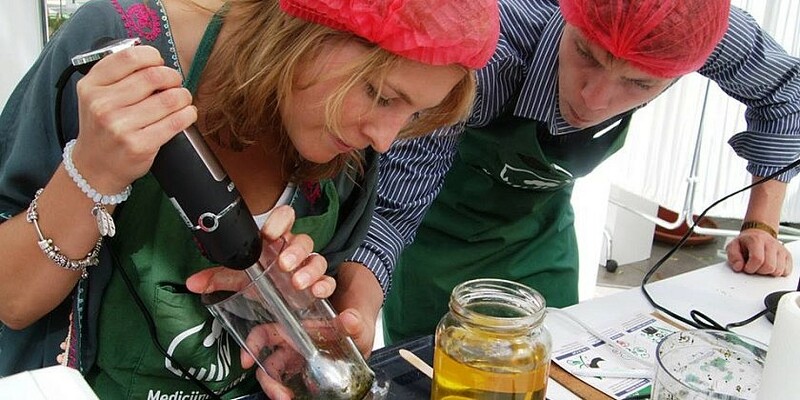 The Medicine Factory is a mobile, publicly-accessible workshop where people can gain access to the healing power of nature to produce their own medicines based on their personal complaints. 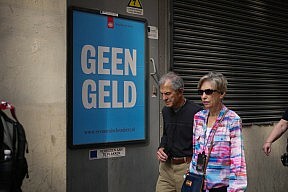 In collaboration with Bas Haring, we used a national poster campaign to teach Dutch citizens a number of lessons about the economy. Instead of paying for the lessons, people could earn money by reading texts through our website. Circus Engelbregt helped residents of the eco-neighbourhood Eva Lanxmeer (situated in Culemborg) to get to know visitors to the public art route LekArt 2016. 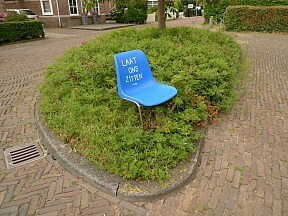 Residents of Eva Lanxmeer were asked to make a seat available along the art route. 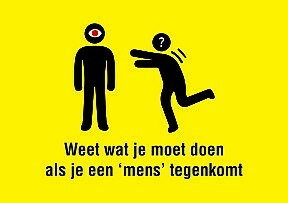 No Ball! Is part of the Ball! exhibition at the Soesdijk Palace. 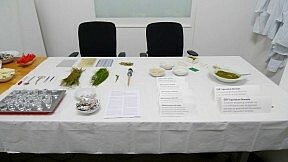 Visitors were encouraged to practise in three specialties at the royal house. The Intuitive Human Approach offers you help in difficult situations when you encounter other human beings. Temporary Master 2014-2016 for the Sandberg Institute. Developed in collaboration with TAAK. Zinder is an online game designed for the citizens of Zaanstad. They are invited to use the game to test their view of the Zaanstad’s future. The player is introduced to various photos, which he or she can indicate as like (‘zin’) or dislike. 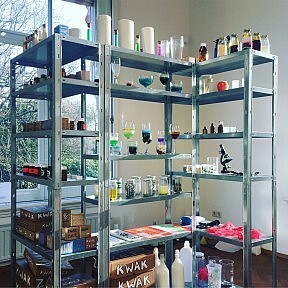 Medicine Factory is an accessible art project by Circus Engelbregt in which health, responsibility, social cohesion and concern for nature and environment meet in a work setting. 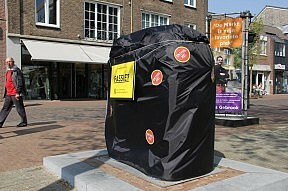 Commissioned by Gemeente Heerlen (local government of Heerlen) we choose ten existing sculptures in the public space and wrapped them as a present. 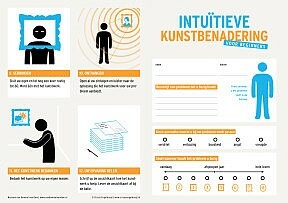 Visitors received an online form beforehand, comprising questions about their (relation to) identity. Based on their answers, we classified the visitors into inner and outer animal species. 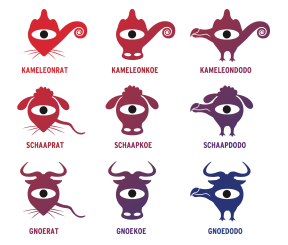 These animals were connected to the character sketches of the participants. 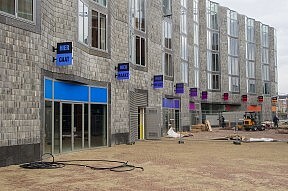 The Buenos Aires apartment complex, at Kop van Lombok in Utrecht, was completed in September 2014. This is also when shopkeepers moved into the building. 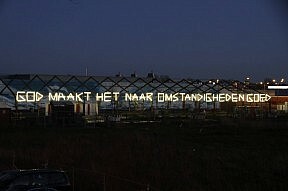 The summer before, at the invitation of the City Council of Utrecht, Circus Engelbregt affixed 104 texts to the complex. In these days of multi-communication loneliness seems to be the final taboo. 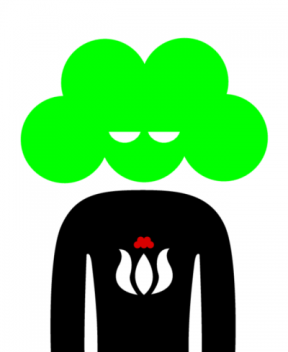 Merely 32% of Dutch people admits to feeling lonely while 98% experiences feelings of loneliness. Stop your resistance to loneliness and embrace it instead. In commission of Mainline (centre for drug use) we developed Intuitive Drug Approach. For consultancy firm AEF’s 2014 alumni staff party we devised a Mini Corporate Takeover. In this takeover we created a course that (former) staff members were guided through after entry and through which they left again later, as part of the exit ritual. For all staff members of the Hersencentrum psychology practice, we developed a day of workshops around the theme of OUT OF YOUR MIND, IN YOUR BODY. 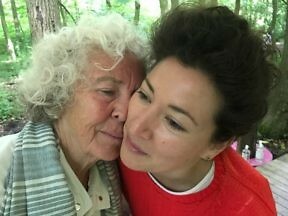 In the unusual location of at the Buitenwerkplaats we gave a broad range of workshops, such as the Lotus meditation, the theatrical encounter, the Intuitive Plant Approach, a mudworkshop and the Box Club. 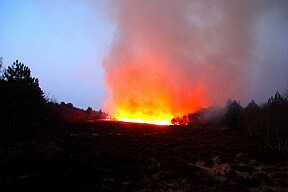 For the Museum Kranenburgh, we made the Growth Fire installation, which we used to study the uniting power of fire. Visitors could write a personal fear (of fire, or of other things) on a sheet of paper and throw it into the fire upon going outside. Using a step-by-step plan, visitors formulate a personal problem and approach a work of art that appeals to them for emotional reasons. 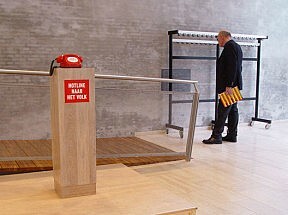 Then the visitor learns to relate to the work of art in a new way. 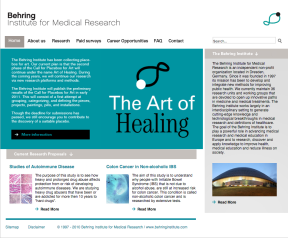 The Behring Institute has been collecting placebos for art. 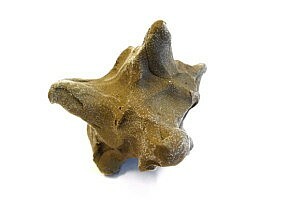 Long-term research on the influence of art on public health using the collected placebos will be carried out beginning in 2011. BETER conducted a study to measure physiological response of subjects who were looking at art and placebo art. 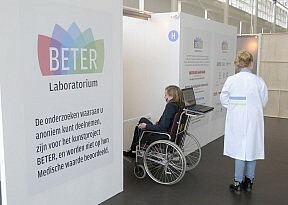 Subjects were placed in a wheelchair, and exposed to a number of diverse artworks and placebo artworks while connected to a device which measures their respiratory rate, perspiration, heart rate, tension in the facial muscles ('laughing muscles') and body temperature. 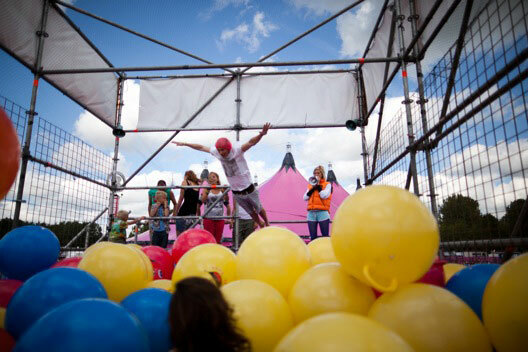 Feel like a child again in the BOUNCING BALLPIT: the ballpit for adults! 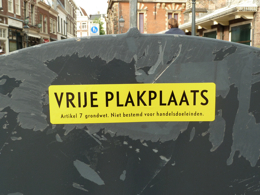 Aardig.nu asks people to make contact again with the Earth by literally shaking its hand. Martijn Engelbregt entrenched himself for a week in a big nature park in Veenhuizen. The specific scenery inspired him to paint signs on recycled wood he found in the environment. At the invitation of Pameijer and Kunsthal Rotterdam, Martijn Engelbregt has realised an art installation on the subject of preconceptions and ‘being normal'. 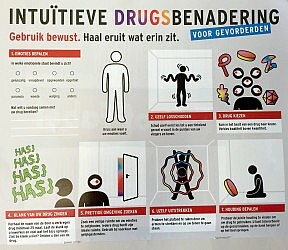 In 2010 Circus Engelbregt devised and designed ADVICE MEDICINE for the Mainline Foundation in order to raise awareness of harm reduction during drugs use. 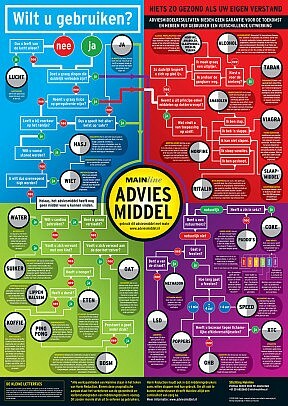 Follow the flow chart and discover which drug you need. FOR ORAL CONSUMPTION is an extensive publication with all results, conclusions and reflections on the research into the art of health by the BETTER Consortium, an initiative of Circus Engelbregt in collaboration with TAAK and Medisch Centrum Haaglanden. 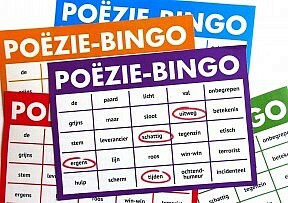 As part of the Amsterdam Poëziefestival 2014 (“Amsterdam Poetry Festival”), we were commissioned to develop Poetry Bingo. 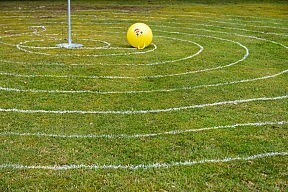 Poetry Bingo is a game of bingo that visitors could play at the festival during the poetry readings. 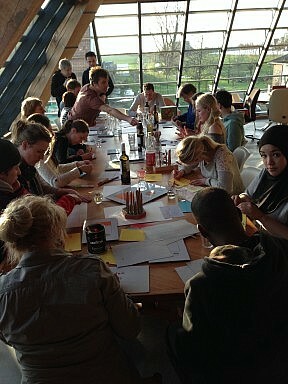 We made a performative work for the Right to Risks symposium at Utopisch Nest Leiden. We organized an elaborate screening for all visitors in order to start the day without risks. 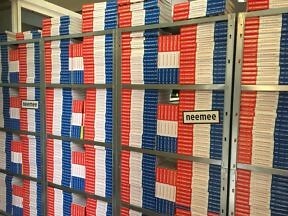 Voor de Middag van het Kinderboek 2013 maakten we een performatief werk waarbij we de bezoekers indeelden op hun eigen tak binnen de branche en welke tak ze een warm hart toedragen. 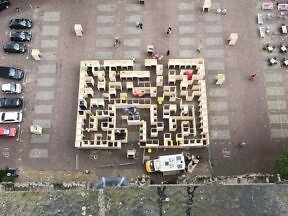 Martijn Engelbregt went for walks with the Oude Groenmarkt in Haarlem as a starting point. Every day he chose a different direction. European legislation prohibits us to inform you on this way about the health benefits and healing powers of PRIMAL © Equisetum Remedy. 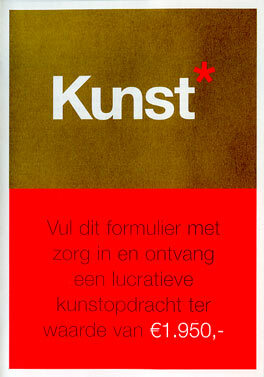 Group show: Catalysis for Life - New Language of Dutch Art & Design. Together with Maarten Baas, Ted Noten and Tomoko Take. Circus Engelbregt created for Mediamatic's Mushroom Paradise a FUNGUS TEST, for visitors to discover which Fungus Type they are and wether they are ready for the Circus Engelbregt FUNGUS RUSH COURSE. Every day more than 35 % of our food is thrown away, uneaten. This situation seems no longer sustainable at a time when many are suffering from hunger and we are quickly and increasingly exhausting the Earth. 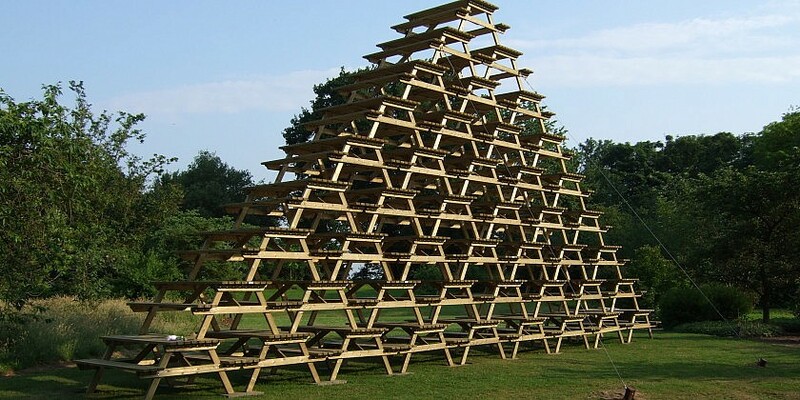 Luckily, there is good news: waste can be eaten! Background music for shopping centre Polderplein in Hoofddorp. These songs were played continuously in the shopping center onInternational buy nothing day, november 11th 2009. 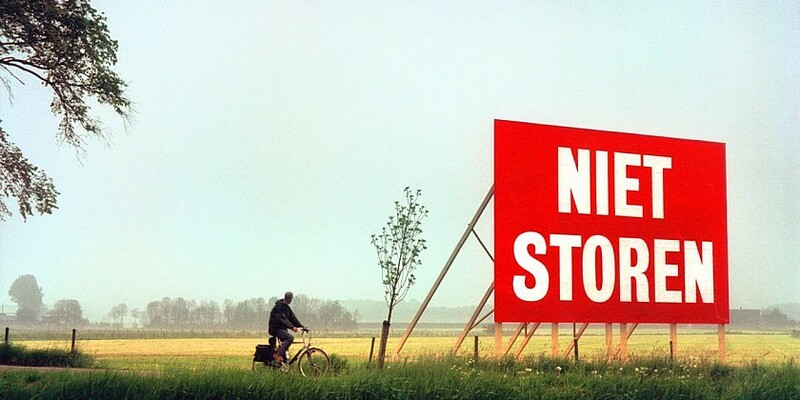 The text Just be sustainable for a moment is repeated over and over again. 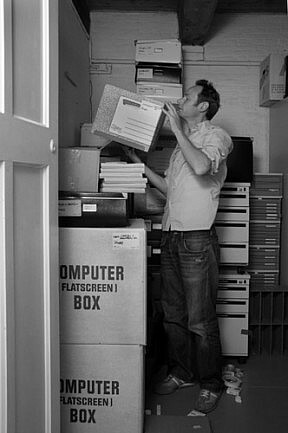 The designers, artists and collectors Martijn Engelbregt and Herman van Bostelen collect material they could use for their work. Eventually, this collection of material becomes an archive, and an archive generally has a system so that you can find things in it easily. 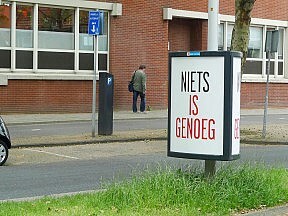 Circus Engelbregt developed a poster campaign that could be seen all over Leiden. What is normal? 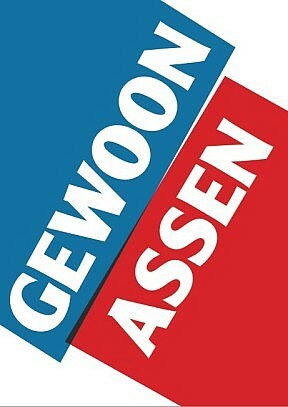 Circus Engelbregt asked this question of all the inhabitants of Assen, the capital city of the province of Drenthe. 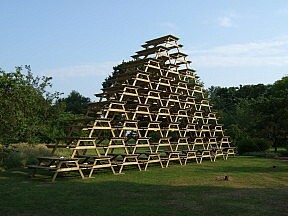 Fries Museum assigned an art project to Martijn Engelbregt about architecture in Leeuwarden. 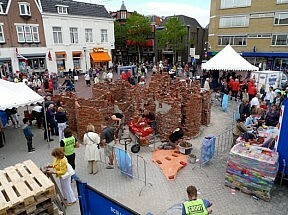 Engelbregt delivered 45.000 bricks door to door, one for each house in Leeuwarden. 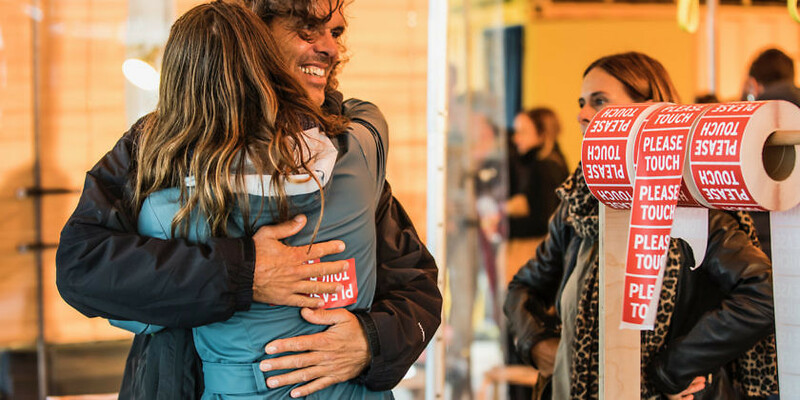 The Shop for Neighbours is a mobile shop filled with products specially developed for situations involving neighbours, from deep-pile slippers to welcoming doorway parties, from YES-YES stickers to wiedergutmachung presents. 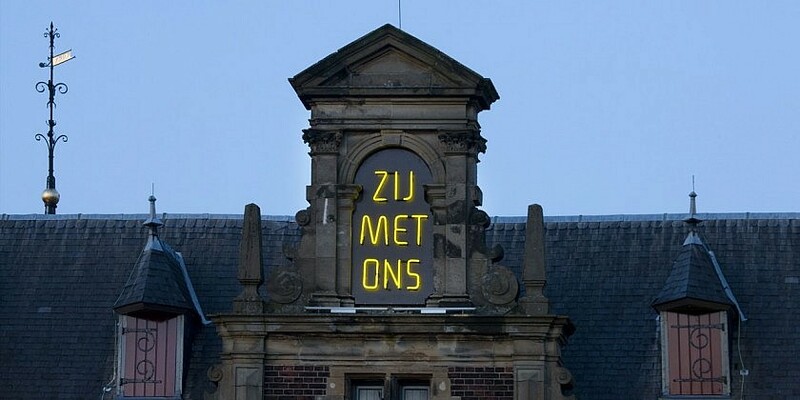 "THEM WITH US" reads the neon sign on the façade of the ancient City Hall of Venlo, the birthtown of xenophobic Dutch politician Geert Wilders. 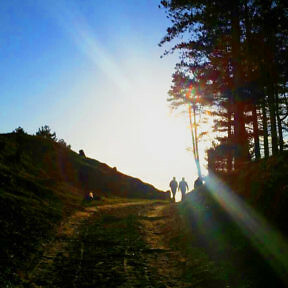 The first One-Day Hike took place on Saturday 25 September 2010. The One-Day Hike is a hiking trail of exactly 23.35 kilometers along the boundaries of the Escamp district in The Hague. 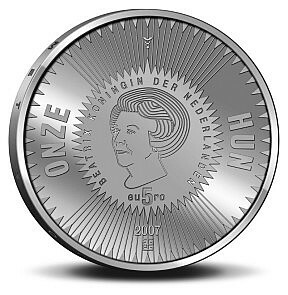 For the Ministry of Finance I designed two coins worth 5, - and 10, - euro commemorating the 400th birthday of Dutch sea war hero Michiel de Ruyter. The Neighbourhood Shop is a mobile store filled with products that are custom designed for neighbourly situations – everything from sound-reduction slippers to an all-inclusive block party bash, and from ‘No Junk Mail’ stickers to neighbourly reparation gifts. Research for a democratic artwork for the neighbourhood in Gorinchem, The Netherlands, called the KREMLIN. 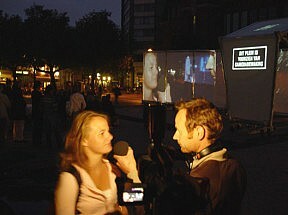 For ‘Plein Museum’, accompanied by a microphone and cameraman he asked visitors to Amsterdam’s Museumplein what they thought of being filmed. This was simultaneously shown on a large projection screen erected in the middle of the park. Turn the tables on your uninvited caller with this script. 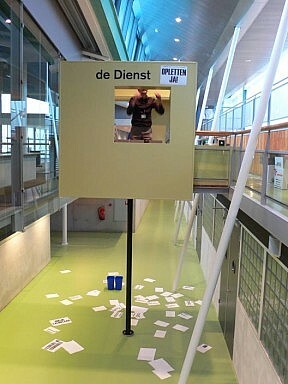 De Dienst (the Service) presented a number of works of art, asking the Dutch people to react and vote for a work of art to be placed in the Dutch Parliament. People could also send in their own ideas and were involved in the process of choosing those works of art that would be installed. 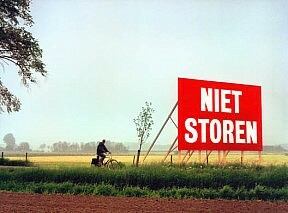 In de zomer van 2005 hebben we in een bijna ouderwets Hollands weidelandschap in het Kromme Rijngebied langs een toeristische fietsroute dit bord van 70 m2 geplaatst. All inhabitants off the new 'town' Ypenburg receive an Art* form with questions like: What is your favorite colour? Are you interested in a custom artwork?Do you 'feel' for art? Would you like to have a personal conversation about art? How do the people of Amsterdam respond to the official questions of whether they’re illegal, whether they know illegal immigrants, or if they’re prepared to divulge this information? 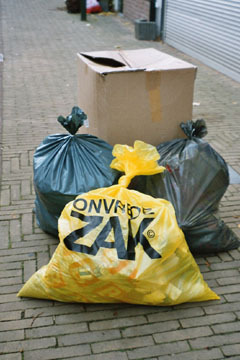 Around Christmas 2003, 200,608 households in Amsterdam received this questionnaire. 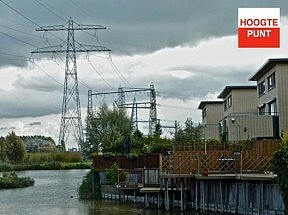 Elke Hoogstrater in Vlaardingen kon zijn of haar onvrede kwijt in de ONVREDEZAK, waarna deze op gezette tijden werd opgehaald: De Hoogstraat kende geen onvrede meer en kon met een schone lei beginnen.